The Park Room at The Grosvenor Hotel Grosvenor House, A JW Marriott Hotel by Buyagift. The Park Room is a stunning space, with vibrant furnishings in cream, grey and green, large mirrors reflecting natural light, a plush abstract carpet, luxurious chandeliers and a beautiful central table adorned with bright flowers and a selection of cakes, which you are invited to enjoy as part of your Afternoon Tea experience. We kicked off our afternoon in the best way possible with a chilled flute of Perrier Jouet. 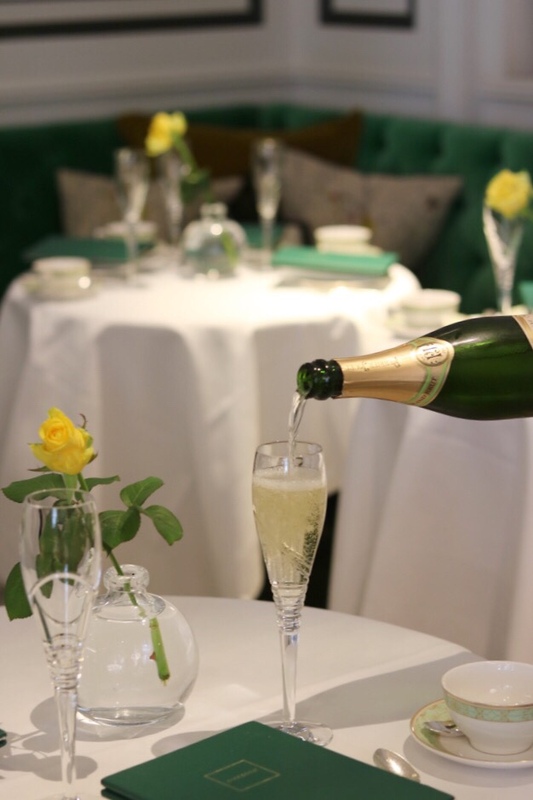 I always believe in having my Afternoon Tea experiences with a glass of bubbles just for that extra indulgence. 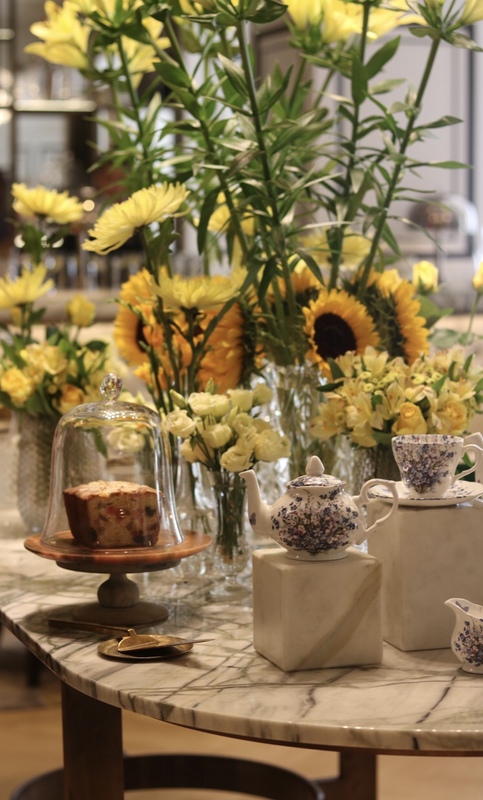 Anna’s Afternoon Tea is named after Anna Maria Russell, Duchess of Bedford, who was a close friend of Queen Victoria. She is credited for creating the first version of an “Afternoon Tea” as she always needed an Afternoon pick me up. The Grosvenor House Hotel’s Afternoon Tea is named in her honour. To start with we enjoyed a sherbet-like strawberry and passion fruit amuse bouche in a cute shot glass topped with candy floss. It was so cute as well as delicious, and the perfect summery start to the experience. We then devoured a selection of finger sandwiches that included cucumber with garden mint butter, smoked Oakham chicken with tarragon and crème fraiche, roast Aberdeen Angus beef with creamed horseradish, honey roast Yorkshire ham with classic Coleman’s English mustard and North Atlantic cold-water prawn with Marie Rose sauce. We also enjoyed some open sandwiches which were absolutely delicious. My favourite was topped with Burford brown Clarence Court egg, mayonnaise and chive, which was sublime. The scones were heavenly and perfectly made. I always prefer a plain scone as I don’t like raisins. We were spoilt with a vast choice of preserves for the scones such as the classic strawberry, rose petal, rhubarb and ginger, gooseberry, raspberry and blackberry, alongside the quintessential clotted cream. The most exciting part of an Afternoon Tea is always the pastries, and we had a choice of five pastries which were a ginger curd and passionfruit coulis, a refreshing mix of green apple and coriander mousse on a bed of crunchy quinoa, a chocolate ring with three types of chocolate, a milk chocolate, almond and banana sponge and a light lemon Myrtle and raspberry Pavlova. The sweet treats didn’t end there and we were able to enjoy a slice of home baked cake from the selection in the centre of the room. As we were so full by this point we opted to take it home to enjoy later. I chose the chocolate cake but the most popular option was the lemon drizzle cake, which looked delectable. I had a fabulous afternoon at The Park Room experiencing Anna’s Afternoon Tea and the venue is absolutely stunning. Thanks to Buy A Gift for the fabulous invite. We were guests of The Grosvenor Hotel and all views and photos are my own. What a lovely classic tea!! Oh it all sounds delicious! This sounds like a fabulous traditional tea!